Workshop mark 2 was an off the shelf metal shed. This was fitted out with insulation and lined with chipboard. Benches were fitted down each side and for the first time, benches were divided by function. This worked really well and suddenly kept things much tidier. Lessons learned-paint any walls as dark walls really make the workshop dark. 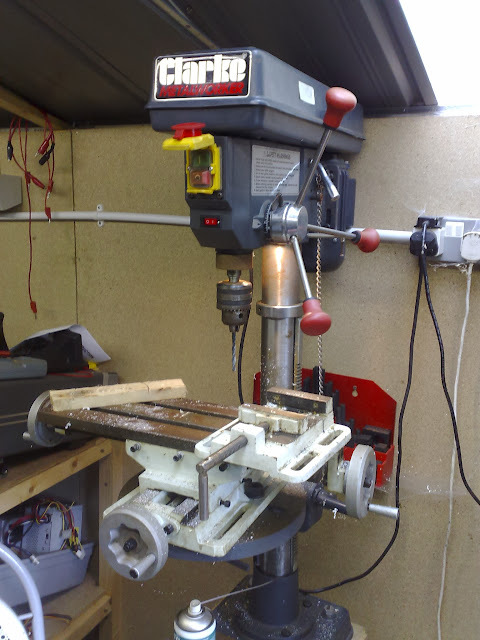 Workshop mark 3 was completely custom built from concrete blocks. After the last workshop, which had a very low ceiling height, this one was built over 3.5m high. Lots of benches and room made for a pleasant working area. The new build workshop aims to take the lessons from the previous builds and create a superior workshop. Although located in a somewhat smaller plot of land as this one will be built at my house for the first time! Trying to do any precision work needs lots of lighting. I personally find having dark areas of the workshop decreases the space I actually use. I currently use fluorescent tubes as these seem to have a good price/performance rating. If I turn everything on in the new workshop, it’s around 800 watts of lighting! Having said that, this still won’t cut it for fine work, so you’ll need task lighting. 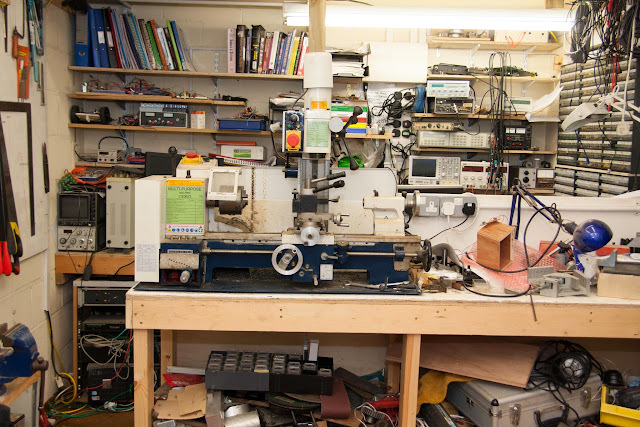 In particular, I keep anglepoise style lamps around the lathe and mill, and LED lighting for the electronics workbench is the subject of an imminent video. So, the electronics bench itself. I still like the standard dimensions of 750mm depth and 750mm height where possible. The depth can be reduced slightly with modern equipment, but it is useful to be able to add sockets at the back of the bench, have PC monitors behind workpieces, etc. I do most of my work sitting down so I like a fairly low bench. For the more mechanical work where it’s helpful to be standing, I’ve got the separate mechanical benches. Length is really important if you end up working on several projects at once, being able to leave setups intact is a great time saver. When we designed Sajjad’s benches he insisted on having no bench legs as these always seem to be in the wrong place when working. After having used his, it works extremely well, especially when using a rolling chair on a long bench, being able to roll from one end to the other is great! So for the new benches, they have legs at each end adjacent to the wall, but no others. Shelving above the workbench is absolutely essential. 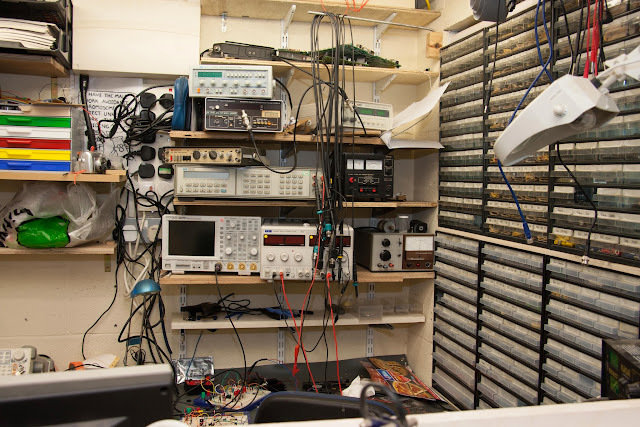 On the old bench, I had test equipment on several levels and project and part storage above this. The shelving has to be deep enough and strong enough to take large amounts of weight and ideally should be adjustable height. I like having one shallow shelf just above the workbench to store hand tools, pliers etc. I also like a shelf underneath the workbench for storing bulkier objects, as well as PC cases etc. The lower shelves provide a great place to mount LEDs for task lighting. This stops the shelves creating shadows exactly where the light is required. For the worktop, I’ve had good luck with plywood or MDF with a loose ESD mat on top. The wooden top is reasonably robust and easily replaced if it becomes damaged from working on heavy cases or similar. The ESD mat is essential for working on sensitive components, but most board assemblies will stand up to being worked on on the wood itself. Through bitter experience, I also now leave at least two inches of bench sticking out beyond any support. This means that vices and lamps which clamp onto the benchtop can be easily fitted without worrying whether the clamp is deep enough. With any modern development, a PC seems invaluable just for looking up datasheets. Beyond this though, many instruments require a PC to run, or just for developing ATE setups. If you’re working with embedded systems, a PC for development will be needed. For this I like to run a USB hub up to the bench so tools can be connected quickly & easily. I also find it useful to have dual monitors for debugging and more advanced work. The assembly area is often slightly separate from the main testing and measurement area. For this I like to have an especially high light level. I tend to use a Mantis Elite at work for work requiring magnification, but facilities at home are also often useful. Personally, I also like to ensure that all my components are within arms reach of the assembly area so building can be carried out quickly and efficiently. Along the same lines, cable storage here is also kept here so this is all kept together. 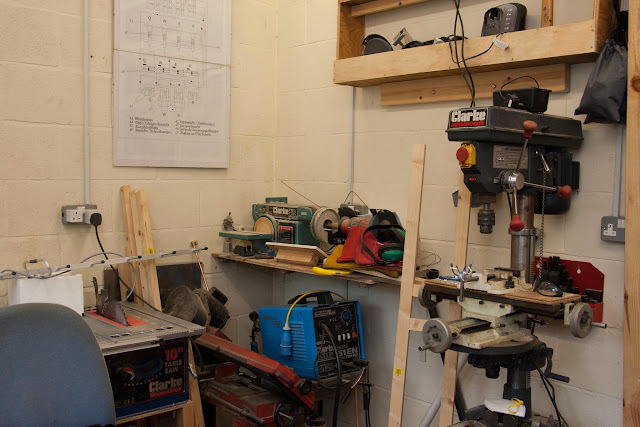 Having storage in the workshop away from the electronics bench itself always helps keeps the bench itself tidier and encourages me to archive equipment and material that I won’t use for some time. 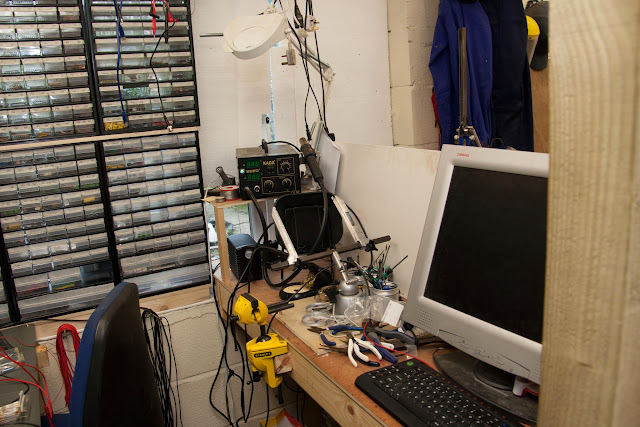 Otherwise, all this seems to mount up at the actual workbench and can get cluttered very quickly. I always find I need lots of sockets for the electrical benches. With modern equipment, the total power demand doesn’t seem to get too high, but this can be a different story if you’re surrounded by boat anchor vintage equipment! I find that having to add extension leads later always ends in mess, so if needed, I try and add them at the start when the wiring can be made neat and routed cleanly. A few years ago I fitted a single network socket for the workshop PC. This was essential for browsing circuits and looking up datasheets. Now though lots of test equipment comes with LAN ports. If these are all connected together, automatic test equipment setups become really easy to get working. These can range from the simple, like logging measurements to a PC, to the complex, like driving a function generator and an oscilloscope to create a basic network analyser. Also a newer development (for me at least) is developing equipment with network ports onboard. The ability to connect these to a complete network is invaluable for testing. I also like to be able to go to a patch panel and be able to create a subnetwork, separate from the main network. This way, when a manufacturing error with a via causes 15V to appear on a network connector pin, the main switch isn’t damaged. 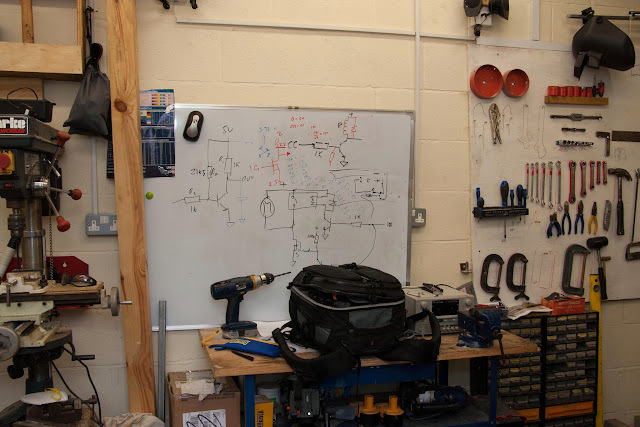 From building test setups, bed of nails, motor test setups down to simple enclosures, all electronic workshops should include some manner of mechanical tools. A pillar drill at least is extremely useful, but when these start to include tools like lathes, mills etc. it’s always useful to keep these separate from the electronics section if possible. There always seems to be swarf, wood shavings and oil being thrown off. In the old workshop, although there was a stub wall around 1.2m high, sawdust and oil was a constant problem. The new workshop contains a full wall between the two sections and the plan is to add a concertina door. This does mean that attention has to be paid to providing sufficient light in both sections, but at least the walls provide more storage area! I find that I end up using a surprising amount of chemicals as part of electronics, from etching chemicals, formic acid for removing the insulation from enamelled wire to chemicals to make various materials fire retardant. Similarly to the mechanical side, mixing these with the rest of the electronics work seems to invite disaster.